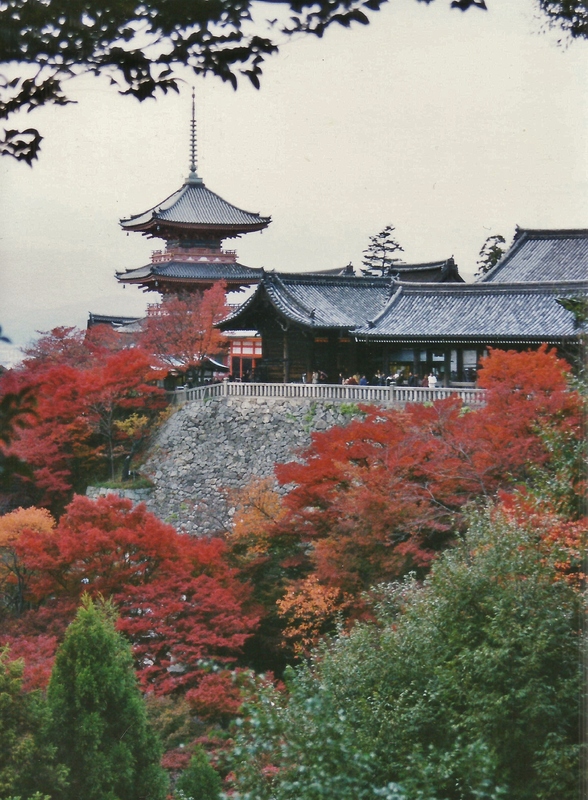 Autumn in Japan ・日本の秋 — through the years. Below I offer a few newly-found, but certainly not “new,” autumn photos taken over the years (from 1984 and 2009). 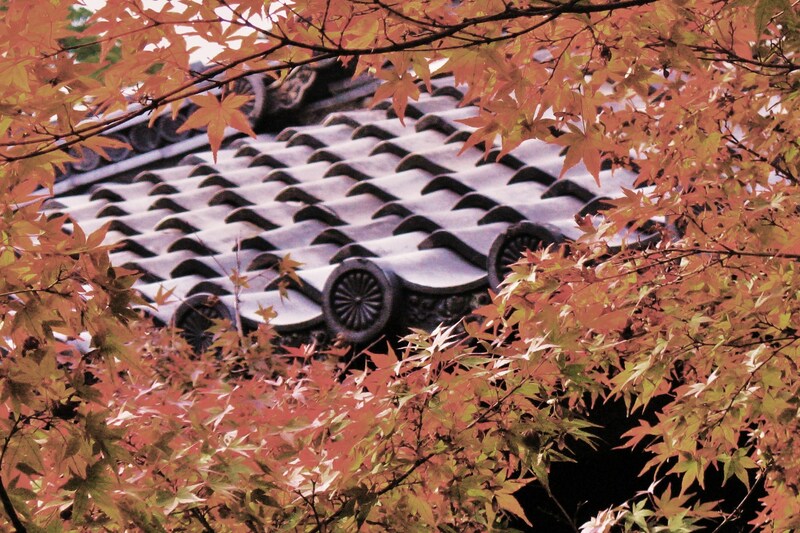 I’ve taken more recent ones, in more recent autumns in Japan, but I thought these would suffice for this year. I may update if or when I run across more share-worthy photos. 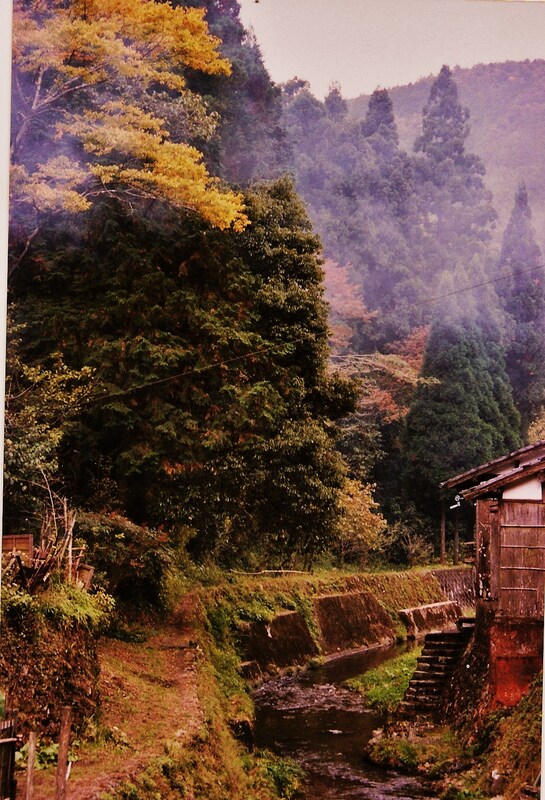 Mist in Kurama. October 2003. 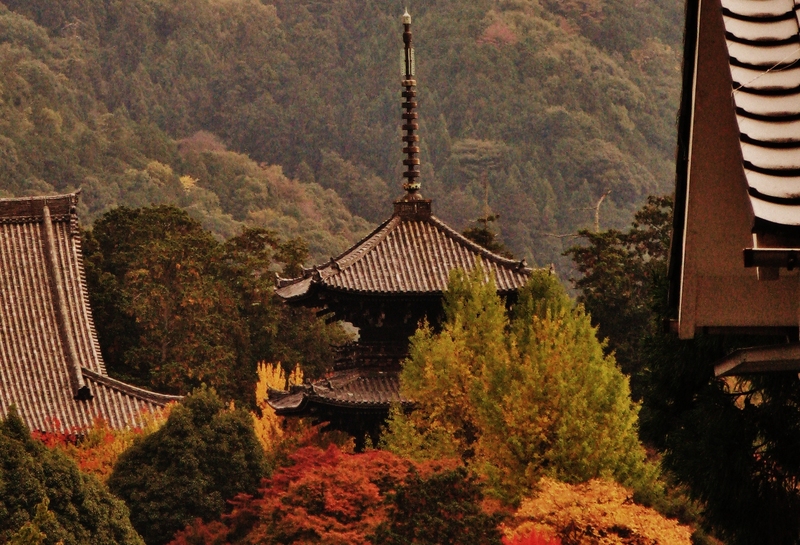 Looking towards Shinnyo-do Temple. Kyoto. November 2009. 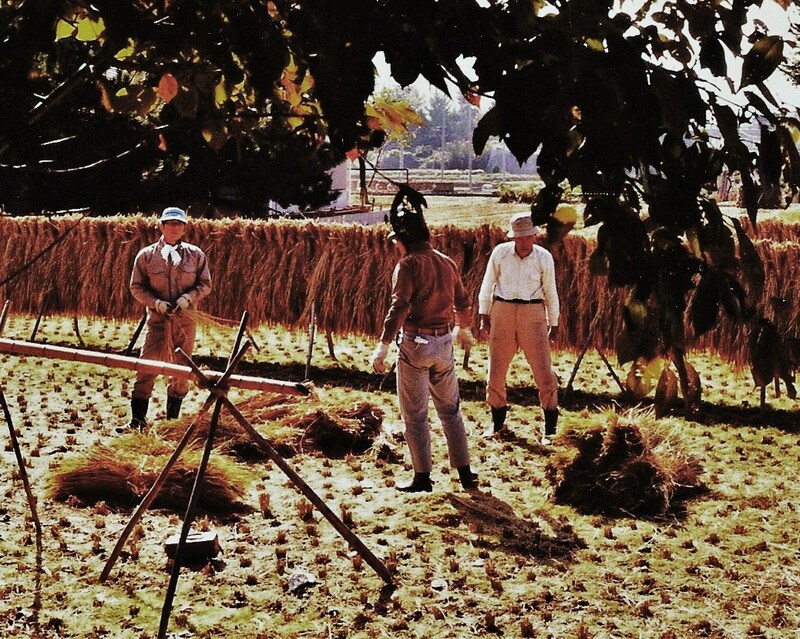 Tea Break During Rice Harvest. Tsuda. 1984. On Jingu no michi, looking towards the Higashiyama. Kyoto. 2003. Along Tetsugaku no Michi (“Philosopher’s Path”). Kyoto. 2003. For much more on, and more photos from, Philosopher’s Path, click here. Evening “light up” at Eikan-do Temple. Kyoto. 2003. 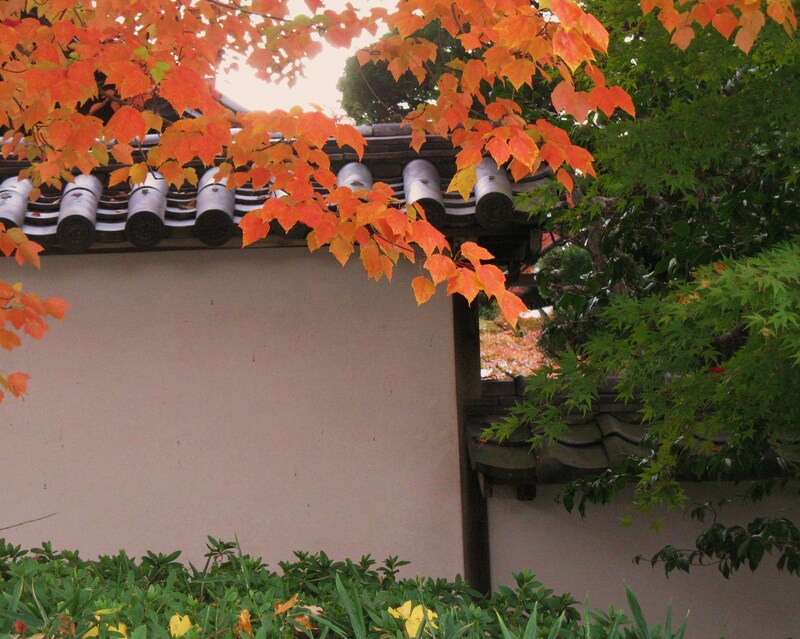 Eikan-do (see photo immediately above) is one of my favorite temples in Kyoto. I highly recommend checking out Eikan-do’s website. In May 2008 one of the head priests granted a group I was guiding an hour-long audience to discuss Eikan-do and some of the basic tenets of Buddhist theology and philosophy. Disclosure: I had a hand in editing one of Eikan-do’s web pages. 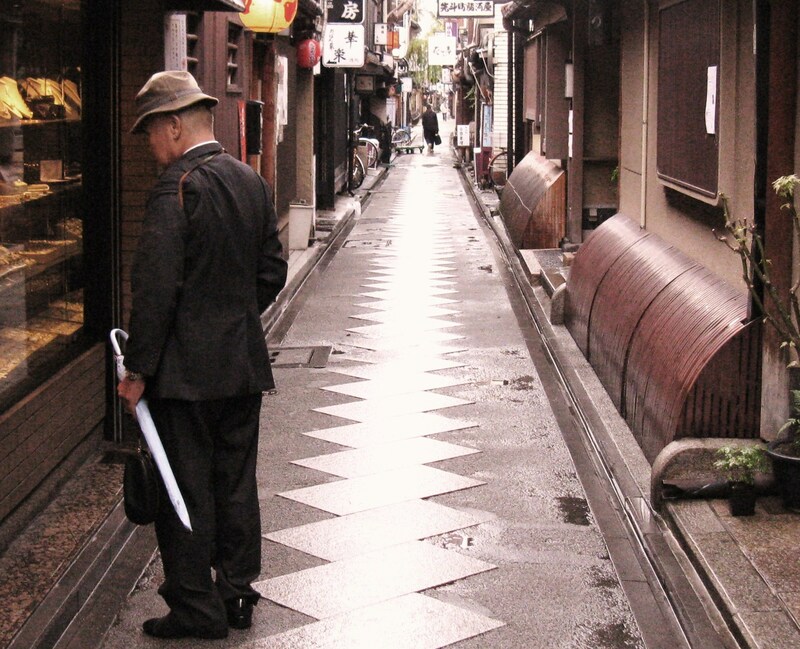 Facing North on Kawabata Street, Kyoto. November 2009. Omiyage ・ おみやげ: Gifts & Gift Giving. 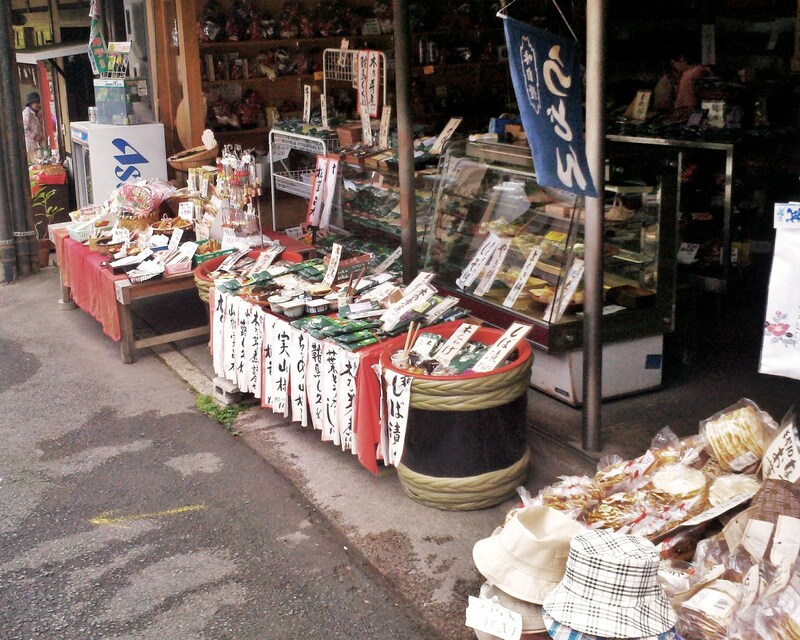 Local pickled veggies & other omiyage-friendly treats. Kurama. 2011. Every culture has its gift-giving traditions. A customary Russian, Slavic, welcome brings bread and salt with it. Gift-giving is a big deal in Egypt, too, when visiting someone’s home. One could write a book on gift-giving customs around the world. I’m sure it’s been done, in fact. Gift giving — when visiting friends or relatives, when going on or returning from a business trip or vacation, when coming back from a day trip to this or that tourist spot or hiking trip or most any leisure activity — is huge in Japan. 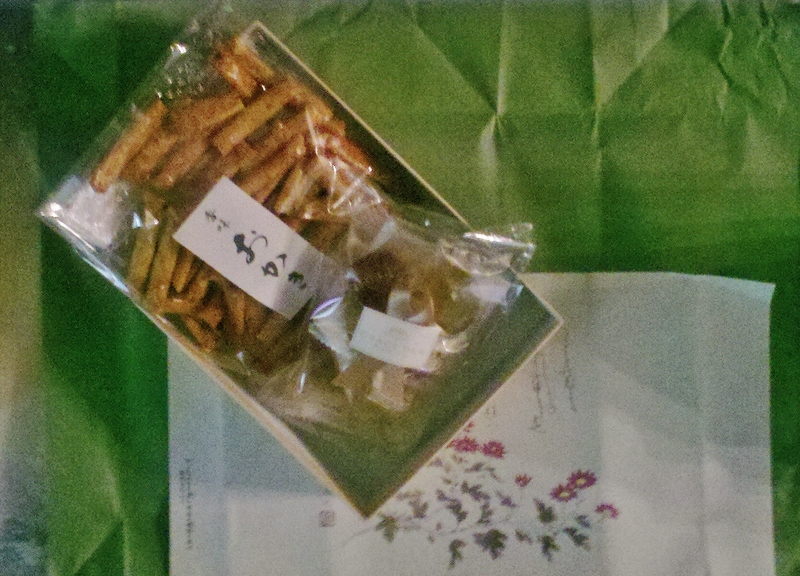 These gifts are called “Omiyage” (Oh・mee・yah・gay or　おみやげ ). There’s a whole industry, an entire economic sector, dedicated to making and selling gifts for travelers. One just can’t visit Kyoto from Tokyo, or Hiroshima from Osaka, or Kinosaki from Yokohama, etc., without bringing back omiyage from family and friends and, if it’s a business trip, office colleagues. There’s simply no counterpart in North America or any other Western country that I know of. In the West we certainly have (cheap, plastic, crappy) souvenir and gift shops in abundance at all our amusement parks, ball fields, tourist destinations and the like. 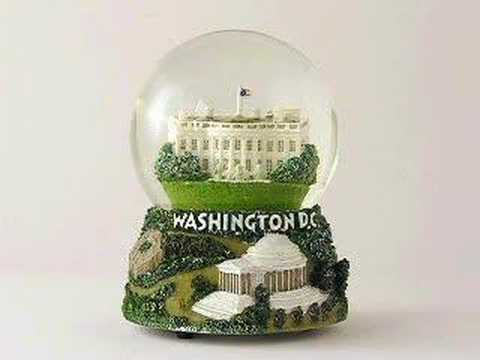 And when it occurs to the U.S., one can pick up a Chinese-made Washington, D.C. snow globe, or Las Vegas key chain, but it’s just not the same. Any time you go on a trip or go to an unusual event, it is expected that you will return bearing gifts. However, most of these gifts are not things to be kept and cherished, but rather food to be quickly consumed and forgotten – space is at a premium in Japan, and so the best gift is something that takes up little space, preferably none. Sure, there is the odd ear cleaner for your grandfather or mobile phone strap for your girlfriend, but since you need to have something for everybody in the class or office, the most common item is a box of small confectionaries. Ideally these sweets are a local specialty of whatever place you travelled to, or otherwise represent that place in some way, but often they are just cakes or chocolates that some company has put in a shiny box. In fact, the actual contents of the gift don’t really matter. In a perfect example of “it’s the thought that counts,” everyone will happily accept your gift and exclaim that it is indeed very delicious. It doesn’t matter that even though you went to Hokkaido, you actually bought your omiyage at Narita Airport. The point is, you went away and returned bearing a box of over-priced mochi. Every major train station is jam-packed with omiyage stores and kiosks, most of which are filled with beautifully-wrapped boxes of sweets (but not nearly as sweet as Western sweets), baked goods, rice cakes, local specialties. The convenience stories in those stations have omiyage sections. 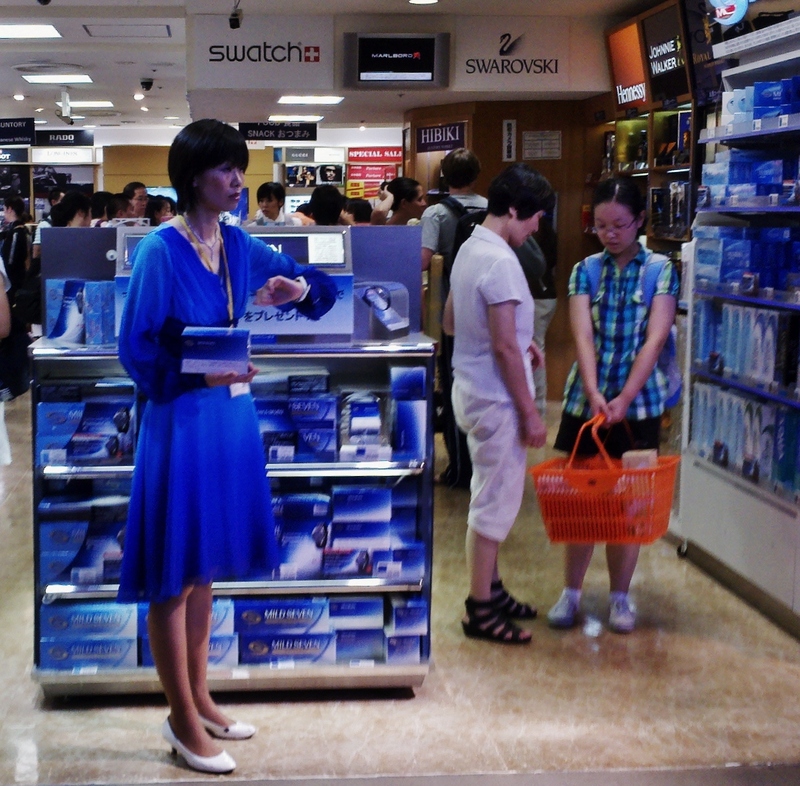 Many middle-sized and minor stations have their omiyage kiosks as well. 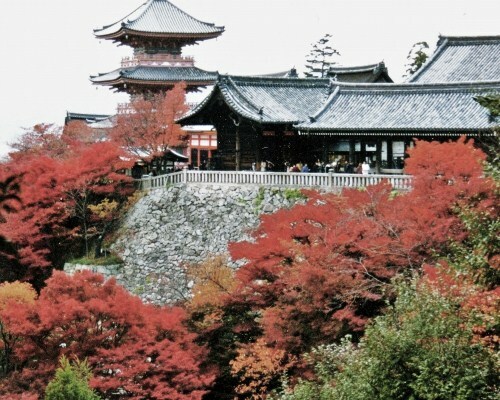 Of course all the tourist spots — the temples and shrines, the nature trails, the hot springs, the museums — have their in-house or nearby omiyage stores and souvenir shops, not unlike their Western counterparts, but moreso. Omiyage & Souvenir Central. 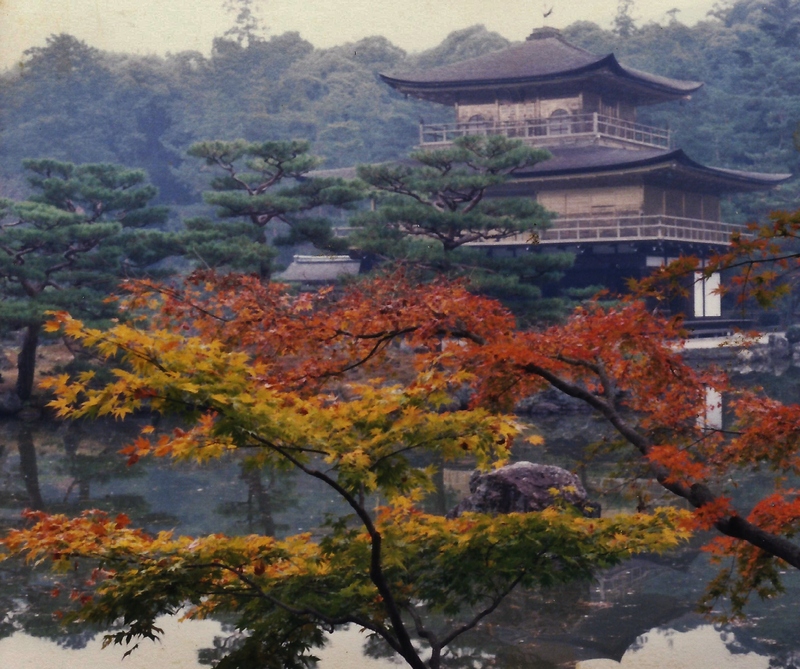 Outside of the Silver Pavilion, Kyoto. 2010.
Business travelers to Japan, and those who welcome business travelers from Japan, are disadvantaged compared to their Japanese counterparts. For the Japanese can just pick up as much or many omiyage as they want at the airport on their way out. Again, American and Dutch and British and Mexican and Canadian, etc. airports have their souvenir shops, but just not of the kind, nature or volume of Japan’s omiyage shops and stands and kiosks. Omiyage (おみやげ) Store. Kinosaki Onsen (hot spring・bathouse town). 2001. One business innovation I’ve just recently discovered, after I received a traditional, multi-wrapped box of wagashi snacks (see photos below) from a Japanese businessman visiting from New York, are the Japanese omiyage shops stationed and staged round the world. These are for Japanese business-types who are themselves posted or on assignment in cities around the world who are called upon to travel to other places in the country they’re based in. What are they to do for traditional Japanese omiyage? Now there’s an answer: go to the traditional Japanese omiyage store in New York, or London, pick up the appropriate number of boxed and wrapped treats, and present them accordingly when visiting Birmingham, Alabama, or Birmingham, England. It’s like staging blankets, tents and food in those areas of there world where you know an earthquake or hurricane will likely someday hit. The aforementioned “Omiyage-Abroad” company is Minamoto Kitchoan and by visiting its website you can get a good idea of traditional omiyage. Omiyage Unwrapped: made in Japan, purchased in NYC, given in Birmingham, Alabama. 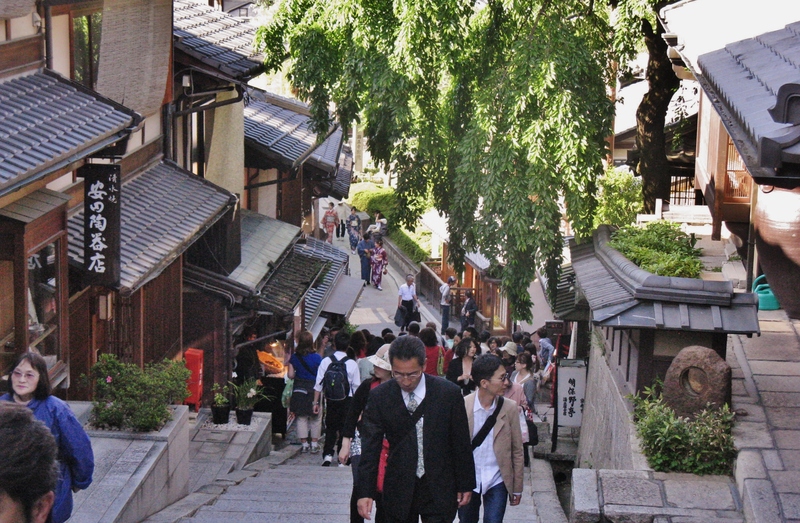 In the photo below you can see Sunday afternoon tourists emerging from the maw of omiyage and souvenir shops that line the street on the way up to Kiyomizu-dera (temple) in Kyoto. Kiyomizuzaka (with Kiyomizudera immediately behind me). May 2010. Sannenzaka (pedestrian street). Nearing Kiyomizu-dera. May 2010. Of course the Duty Free Shops, this one at Narita Airport in Tokyo, are good for buying “less traditional” omiyage (cigarettes and liquor). Liquor used to be a very common omiyage among international travelers, but not so much these days. Duty Free Shop. Narita Airport (Tokyo). August 2012. * There are no hard-and-fast rules. * The more “local” the gift (from your city, your area, your state/province) the better. * Food is good, but it will need to travel well and some foods (meats, sausages, for example) are subject to Customs confiscation. * The gift should be wrapped. I’ve started packing wrapping paper, cheap scissors and tape in my checked baggage and just wrapping gifts in my hotel room upon arrival in Japan. * Local “coffee table” books — with nice, scenic, historical, culturally-informative photos and simple explanations about where you’re from always make good gifts. * I’ve bought sheets of interesting U.S. stamps, have had them inexpensively framed, and have given them as omiyage. Their flat, light, not subject to breaking (if packed well) and unique. * You should offer the omiyage with both hands, and accept omiyage given to you in the same way. It’s just polite. Kinosaki, or thereabouts. October 2001. Here are 5 Front Page favorites from the past few months I want to highlight for the next several days. Then I plan to get on with our “October Schedule.” That will include a re-post of an Autumn favorite, an homage to all sorts of Food, ducking into a small Shinto Shrine I happened upon in Kyoto about 6 or 7 weeks ago (one that I’d passed by hundreds of times over the years; one that, to my shame, I never took the time to notice before), a trip to Kodai-ji Temple at night, and, of course, an updated Halloween-in-Japan Extravaganza. 1. SIGNS. 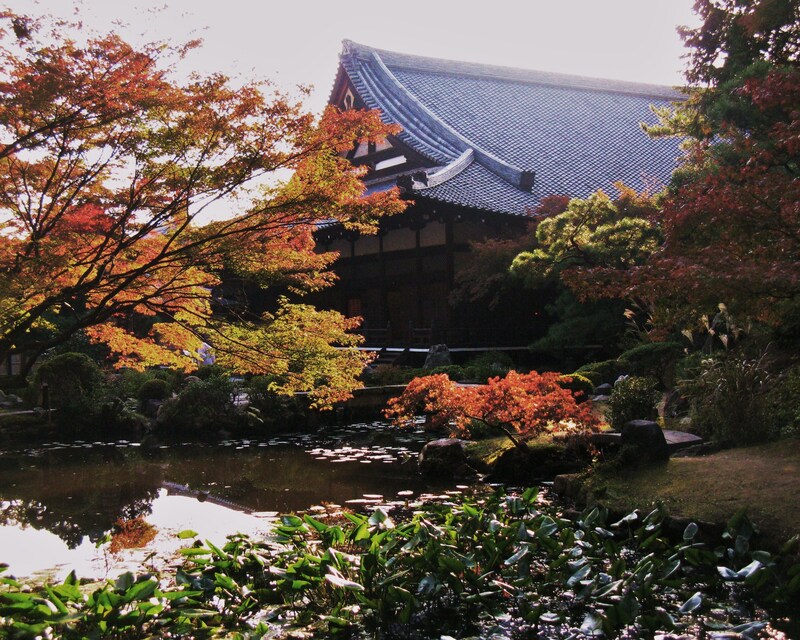 Upon returning from Japan (business trip) last month I very much updated a post from last year. 2. KYOTO. WHERE THE RIVERS MEET. The Kamo & the Takano. 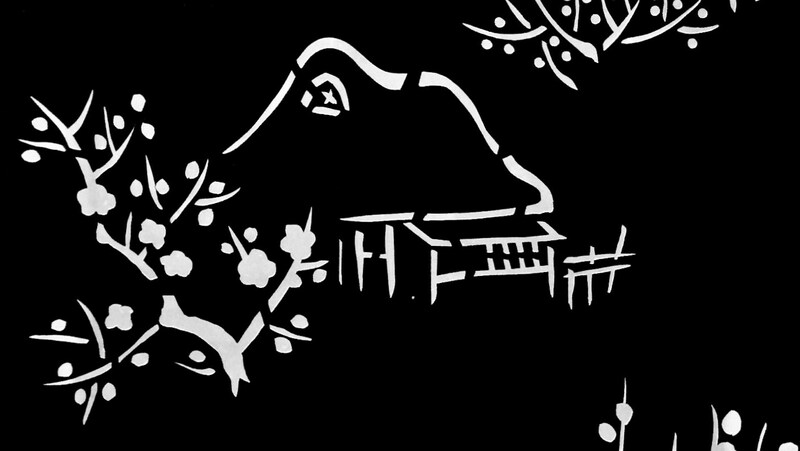 . .
Han-Eri Stencil for Kimono. Meiji or Taisho Era. A friend's gift. August 2011. 3. KURAMA. 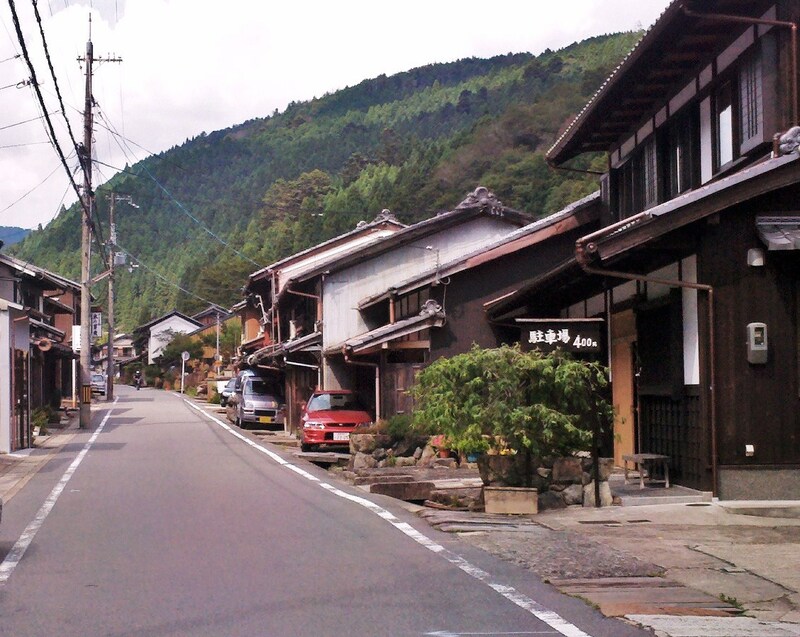 A pretty, quiet and historic little mountain town, just north of Kyoto. 4. 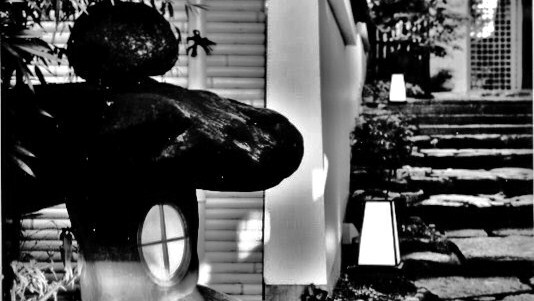 ZEN & SHINGON BUDDHISM AS PHOTO TECHNIQUE TOUCHSTONES. That pretty much says it. Inn entrance near Yasaka Shrine. Kyoto. 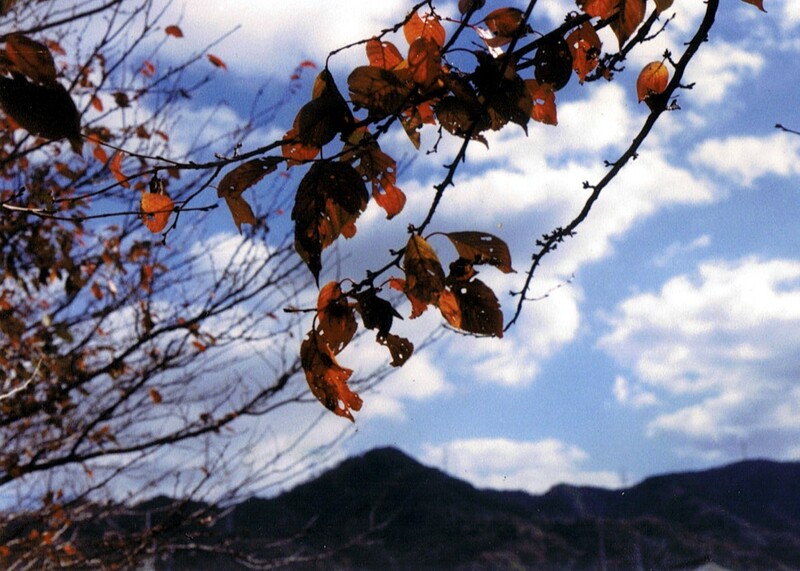 Autumn 2003. 5. ICHI-GO ICHI-E ・ 一期一会. One moment, One meeting. Savoring what will not come again. 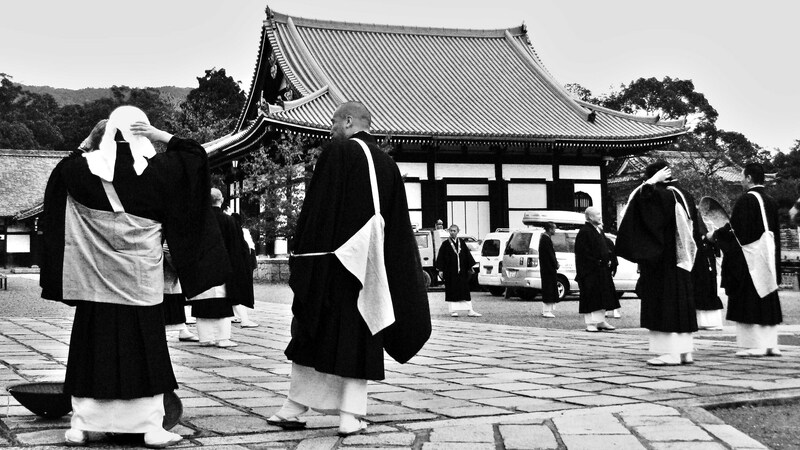 Priests at Kurodani Temple. November 2009. Additional: I updated the photo gallery / essay “Shapes & Shadows,” too. At this writing it’s been about 2 weeks since I visited Kurama It’s a small town with one main street, about 30 minutes north of Kyoto by train. This was my third or fourth trip to Kurama over the past eight or nine years. Kurama’s quiet and relaxing, with some stunning scenery. Photos — and one short vid — follow, along with how to get there and some history and other items of interest. Unless otherwise noted, all photos were taken with my Droid phone on August 13, 2011. 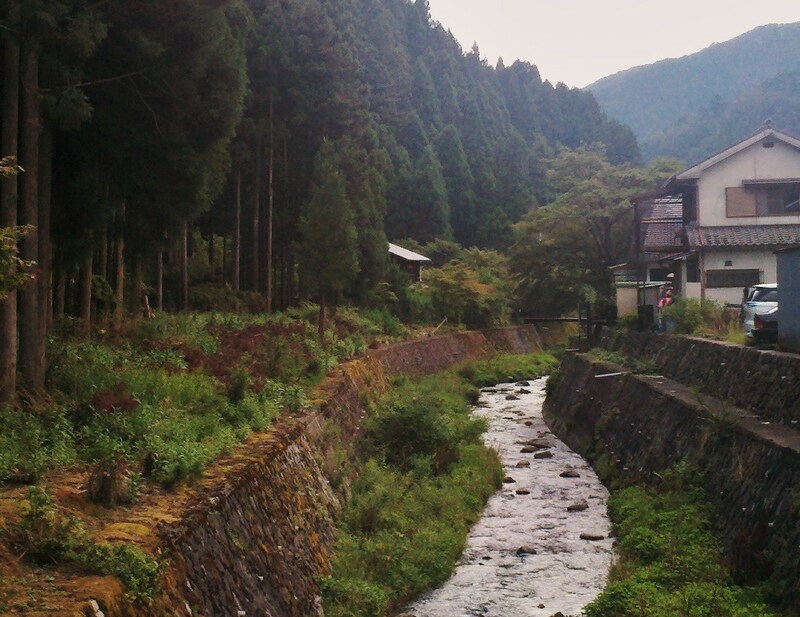 Getting from Kyoto to Kurama (details at the very end) . 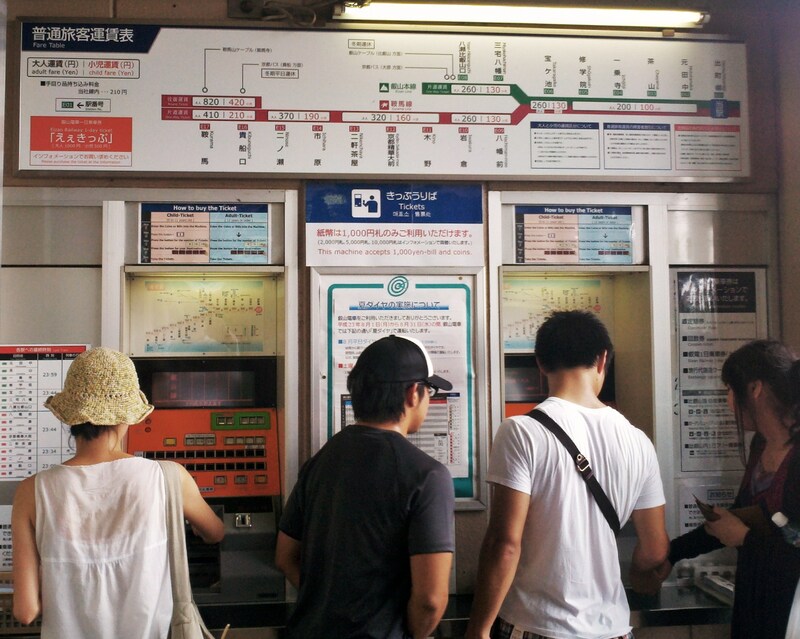 . .
Eizan Line ticket machines at Kyoto's Demachiyanagi Station. The little 2-car "One Man" Eizan train pulls into Demachiyanagi. 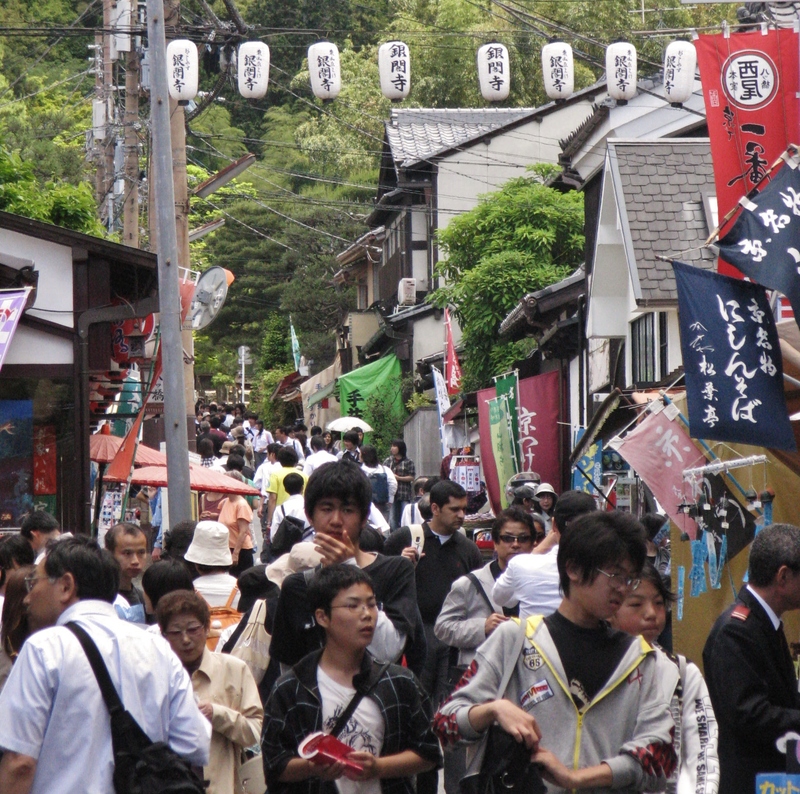 The trip from Demachiyanagi to Kurama takes just a little more than 30 minutes. Once getting out of the suburby scenes of northern Kyoto, these are the kinds of views you can see. 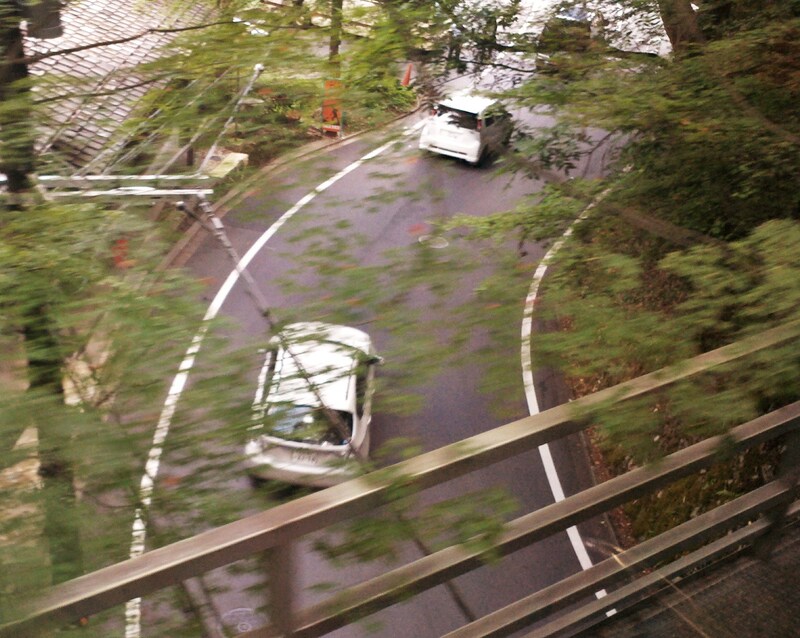 . .
From the train, on the way to Kurama. Entering the southern outskirts of Kurama. Many people de-train at the second-to-last stop, Kibune, and take the hour hike along a beautiful trail into Kurama, winding up just behind Kurama Temple (see below). 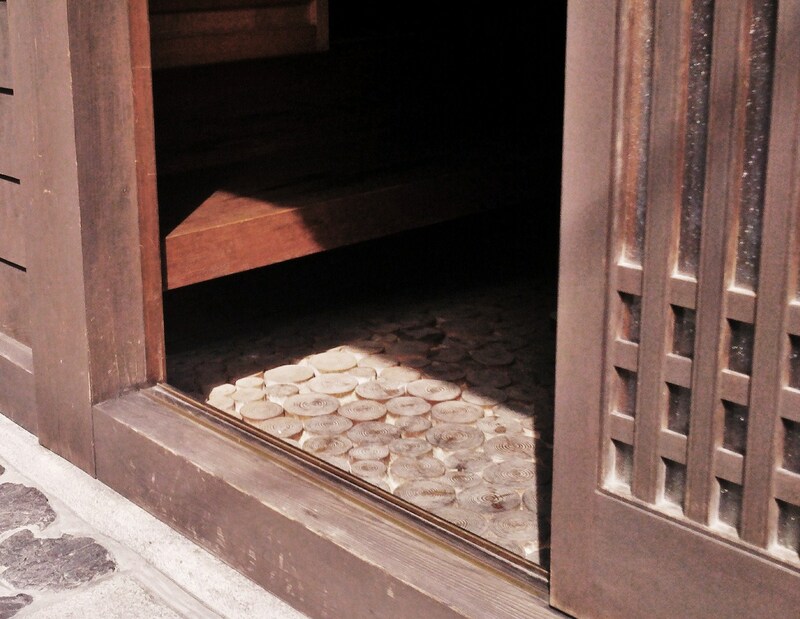 There are several high-end, traditional inns (“ryokan”) in Kibune, though I’ve not had the pleasure, yet. If you go straight into Kurama here is some of what you’ll see when you get into the Kurama Station. . . The most boring pic I've ever posted. 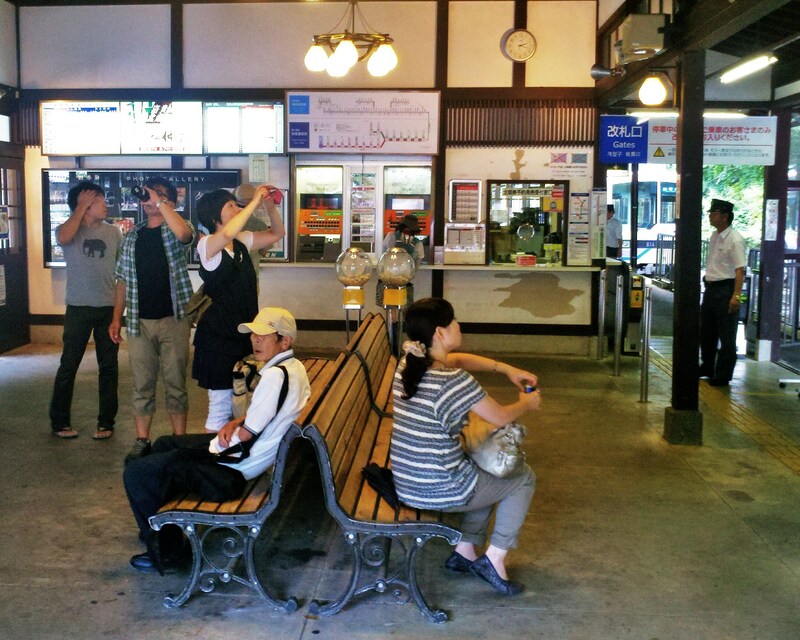 Ticket taker at Kurama Station. Inside Kurama Station. You can see the train, far right. 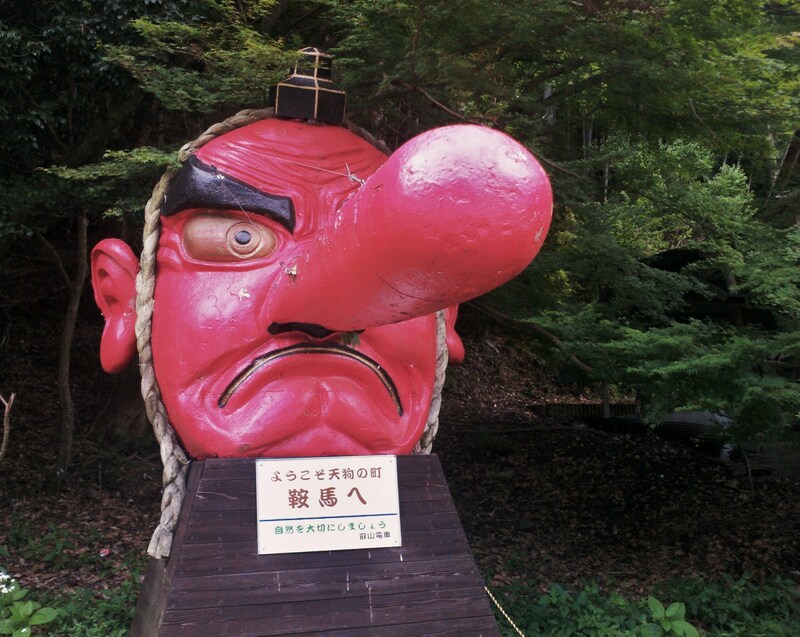 The big Tengu (goblin) mask. Just outside Kurama Station. Tengu 天狗 are mountain and forest goblins with both Shinto and Buddhist attributes. Their supernatural powers include shape-shifting into human or animal forms, the ability to speak to humans without moving their mouth, the magic of moving instantly from place to place without using their wings, and the sorcery to appear uninvited in the dreams of the living. . . In paintings and woodblock prints, the boar often appears as the steed of the tengu or of their king, Sōjōbō 僧正坊. Sōjōbō is closely linked to famed warrior Minamoto no Yoshitsune 源義経 (1159-1189), one of Japan’s most revered samurai. In a well-known legend, Yoshitsune lived among the tengu in his youth and received training in the arts of war from Sōjōbō himself. Sōjōbō,’s home? Mount Kurama into which the town of Kurama is nestled. 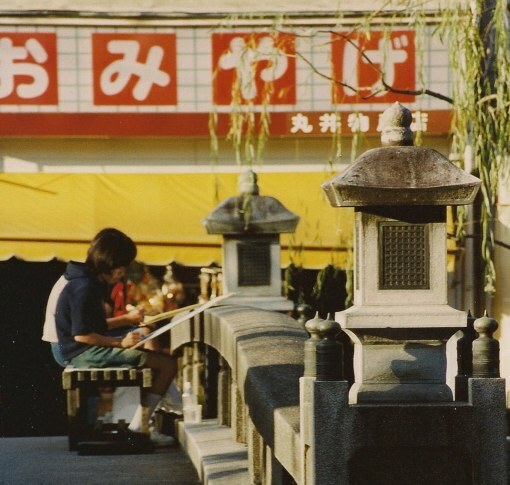 The visitor, turning left when exiting the train station parking lot, needs only two or three minutes to walk past the souvenir stalls and stores (or not, as one pleases) and to the foot of Mount Kurama and the entrance to another Kurama claim to fame, Kurama Temple . 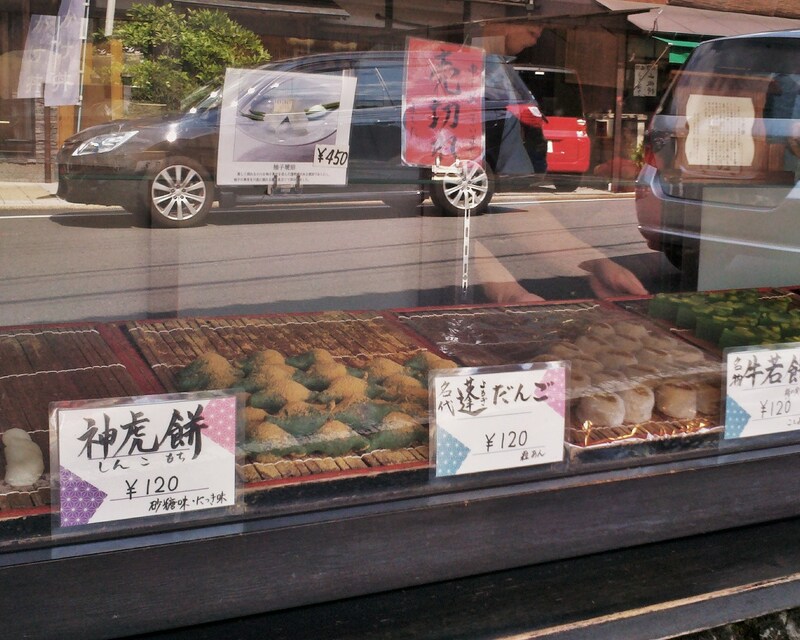 . .
Sweet treats at a shop along the road to Kurama Temple. Souvenir stand, featuring mountain vegetables. Kurama. 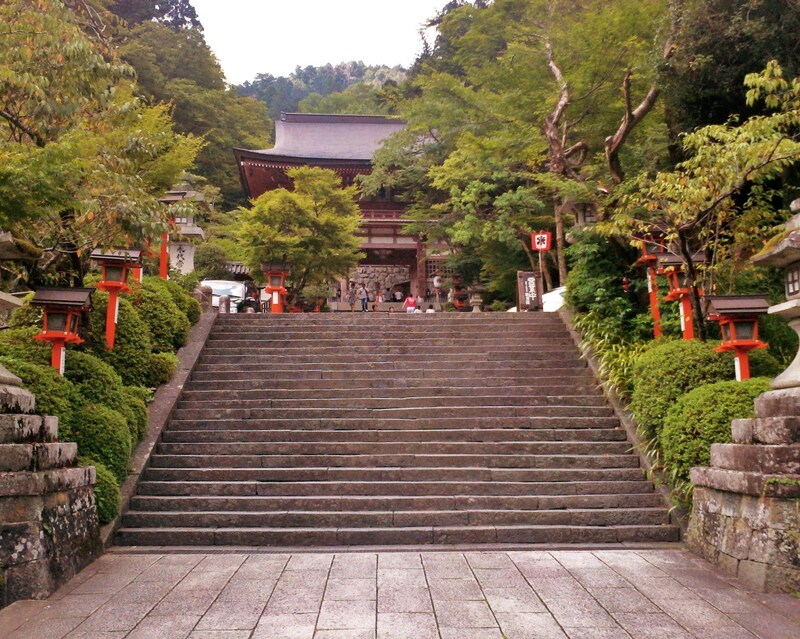 The foot of Mount Kurama and entrance to Kurama Temple. 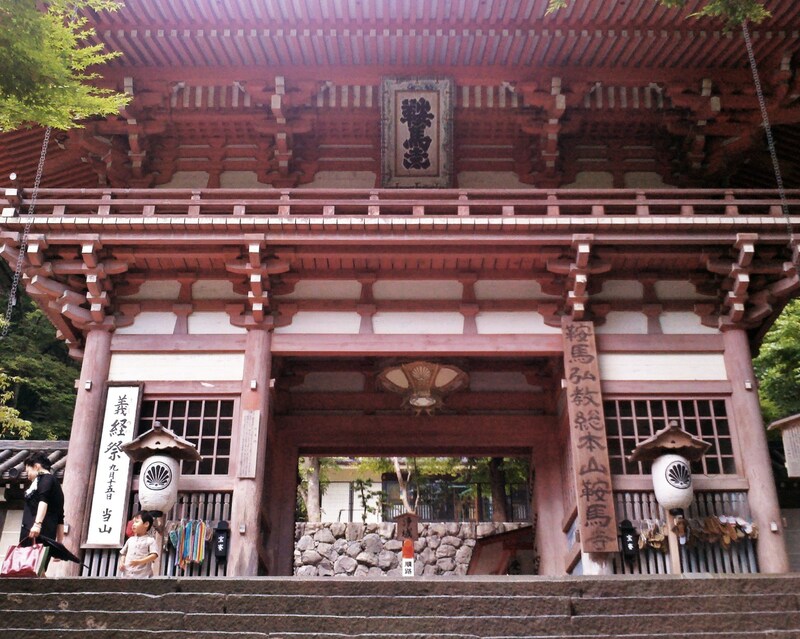 Kurama Temple's Main Gate. The temple was founded in 796. 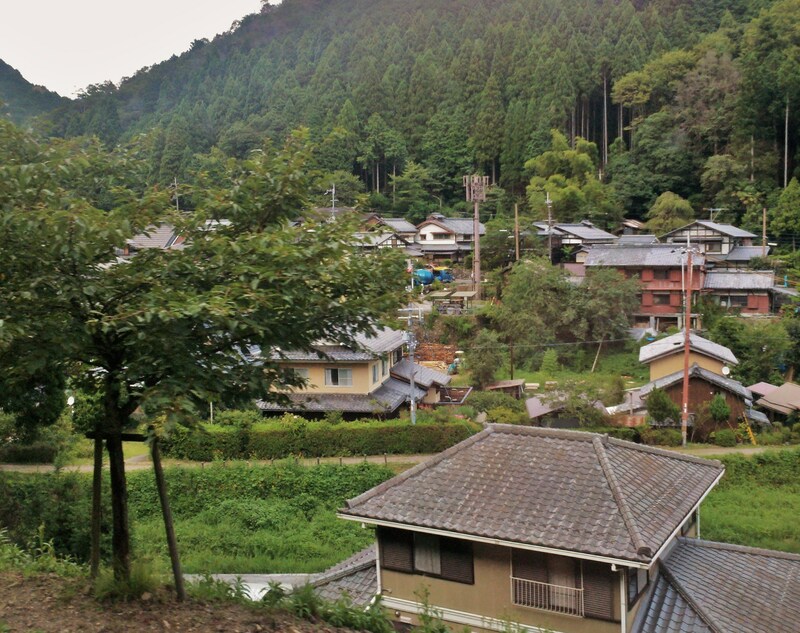 My favorite Kurama activity is just walking from the Temple up the main (and only) road through town to Kurama Onsen (hot springs & inn). The road slopes gently upward and parallels the small, pretty Kurama River (which, by U.S. standards, would be called a creek, or stream or run). I always take a little trail from the road, behind a couple of houses and walk along the river, too. 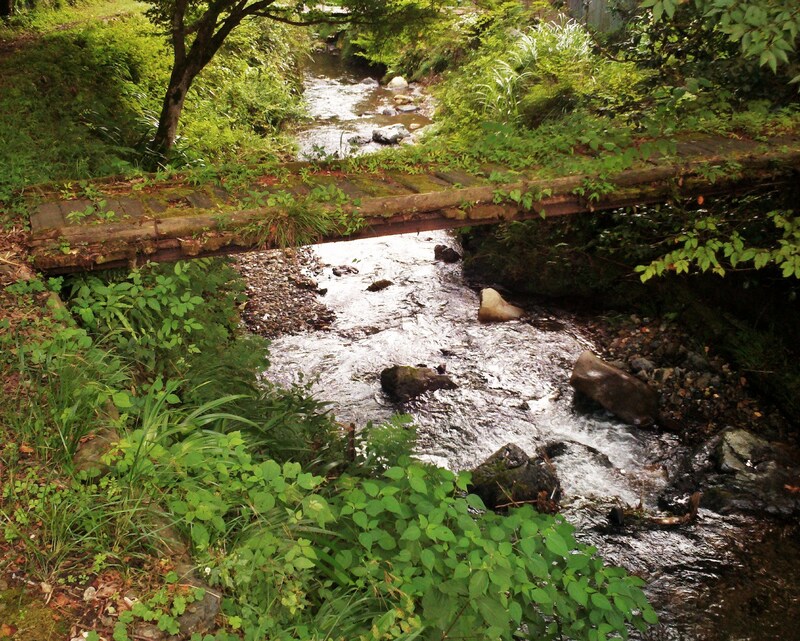 It’s one of my favorite peaceful and contemplative places in Japan. . . 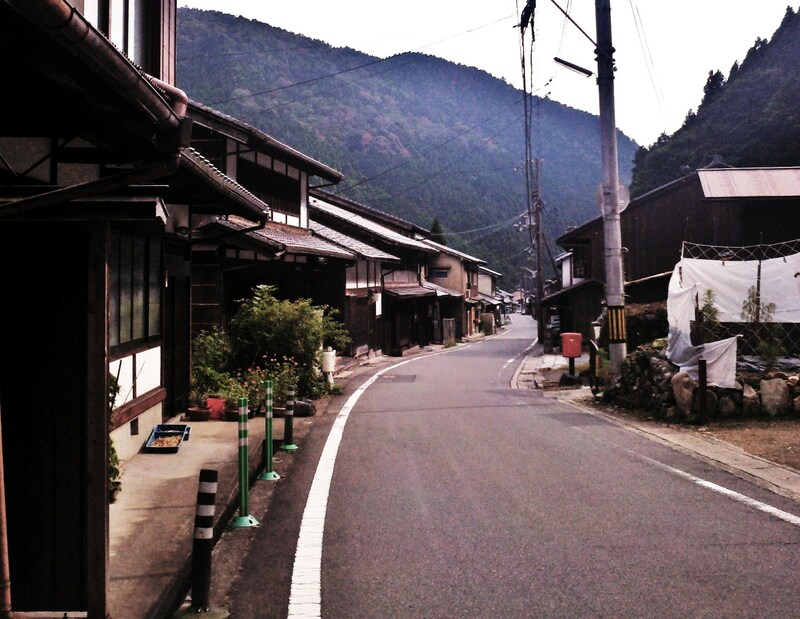 Looking north, up the road towards Kurama Onsen. 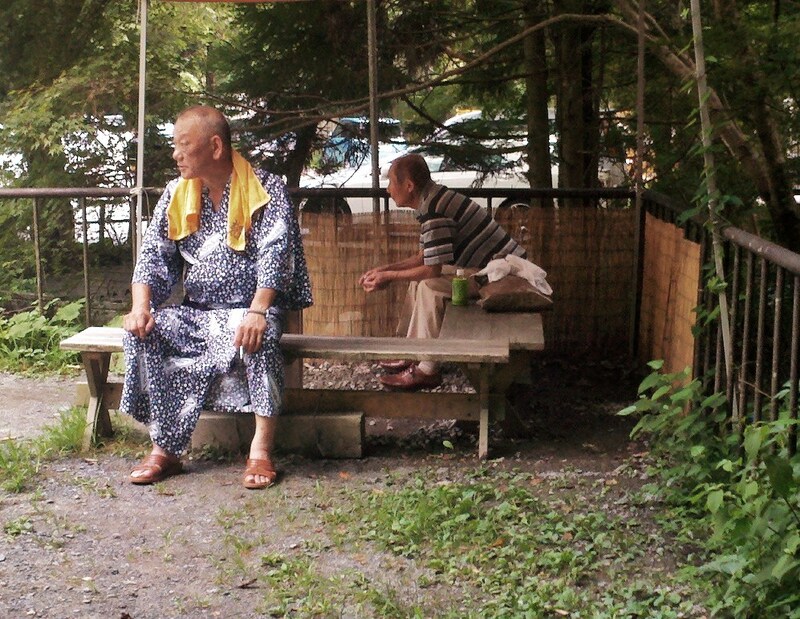 A couple relaxes at a teahouse along the road. Kurama. Relaxing with a book. Along the main road. Kurama. Entrance (genkan). Along the road. Kurama. Bridge over the Kurama River. Just off and beside the road. 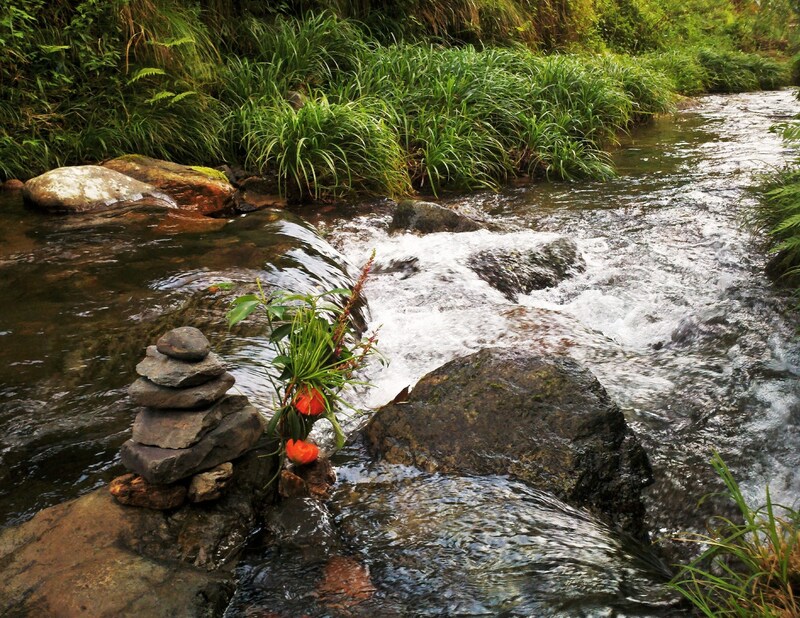 Someone, not me, made this little makeshift shrine. Kurama River. 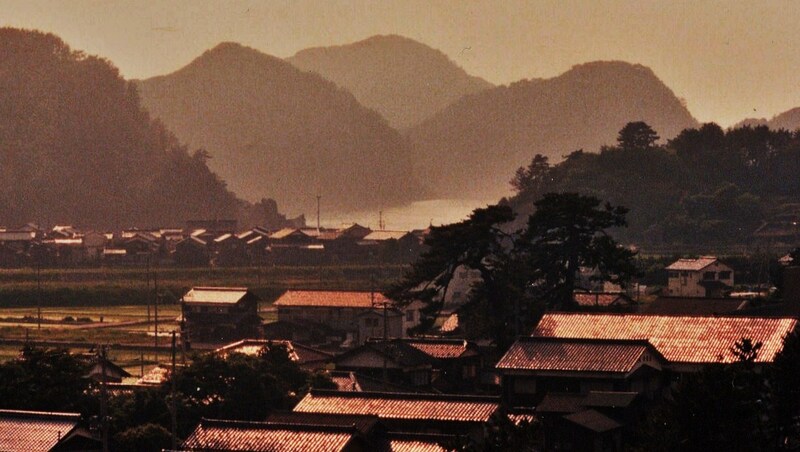 Looking back south towards town, along the Kurama River. 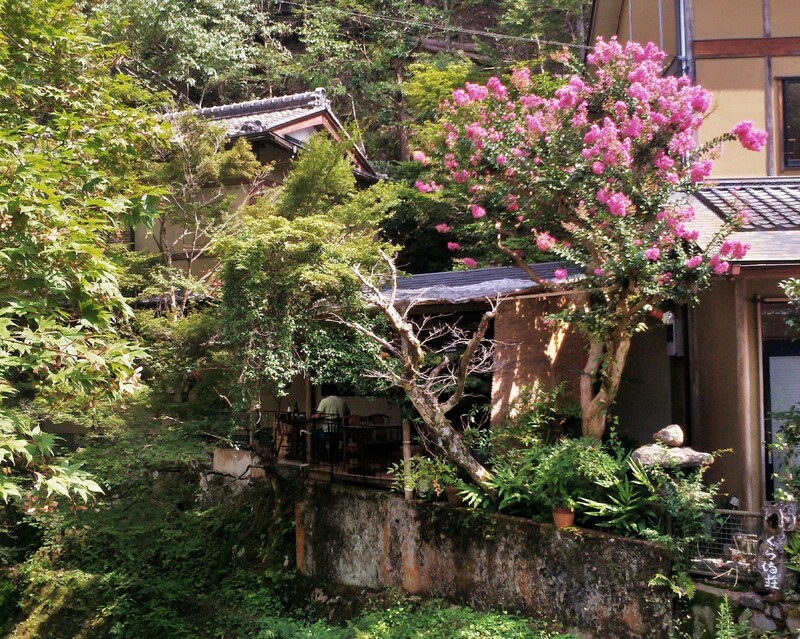 Kurama Onsen (hot springs) & inn). 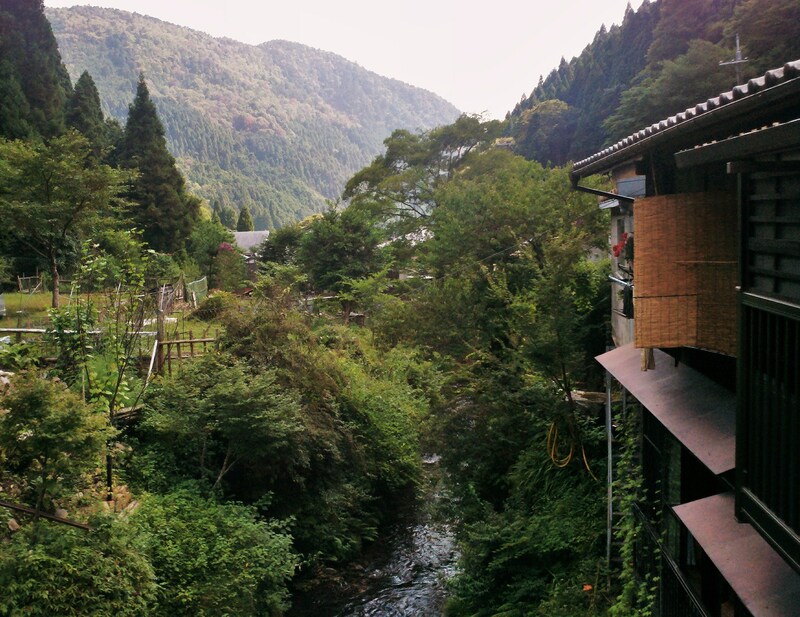 Here’s what you see when you approach Kurama Onsen. . . 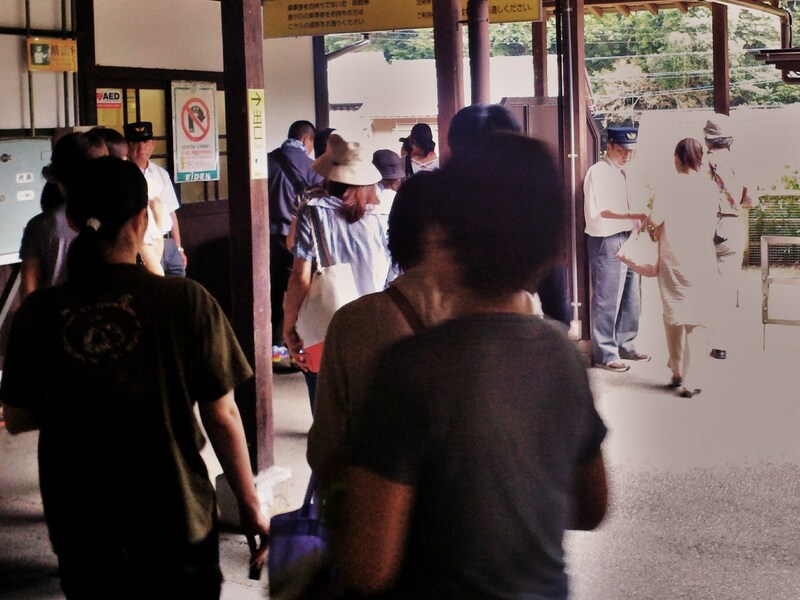 In front of Kurama Onsen. 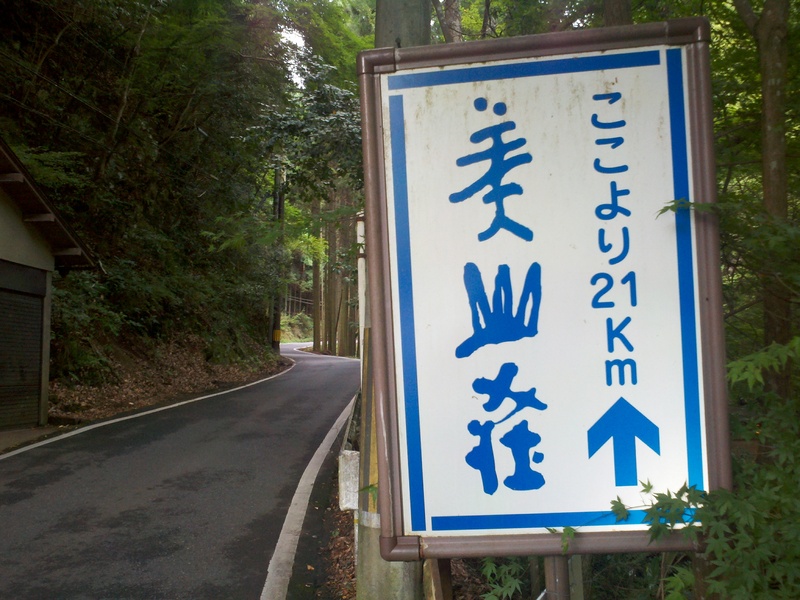 Sign for inn, Miyamasou, just up the road. Tea (and Beer) House over the Kurama River. Kurama Onsen. Taking a smoke break. Kurama Onsen. The inn’s interior, lobby, is a bit shabby and touristy. 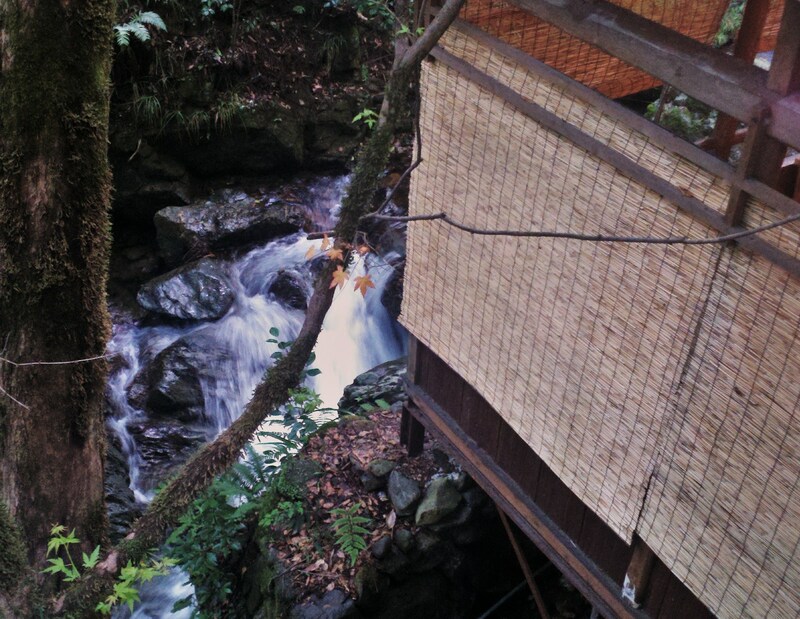 But the outside baths are beautiful and the view of Kurama Mountain looming overhead is a Lifetime Thing to Enjoy & Behold. 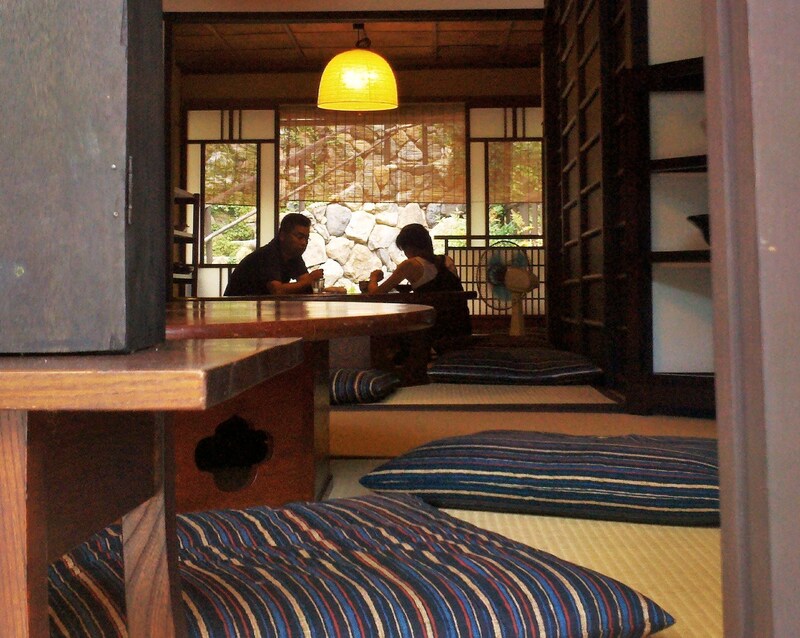 All the rooms are Japanese-style, with tatami mats and very little furniture. One night plus a traditional Japanese dinner and breakfast the next morning will set a couple back about $200. There’s an inside bath facility (Men’s & Women’s separate) that are nice, but nothing overly special. A trip there costs about $30, whereas a ticket to the outside baths-only (with that beautiful view) are only ¥1,000, about $13 these days. On the way back down to town from Kurama Onsen. 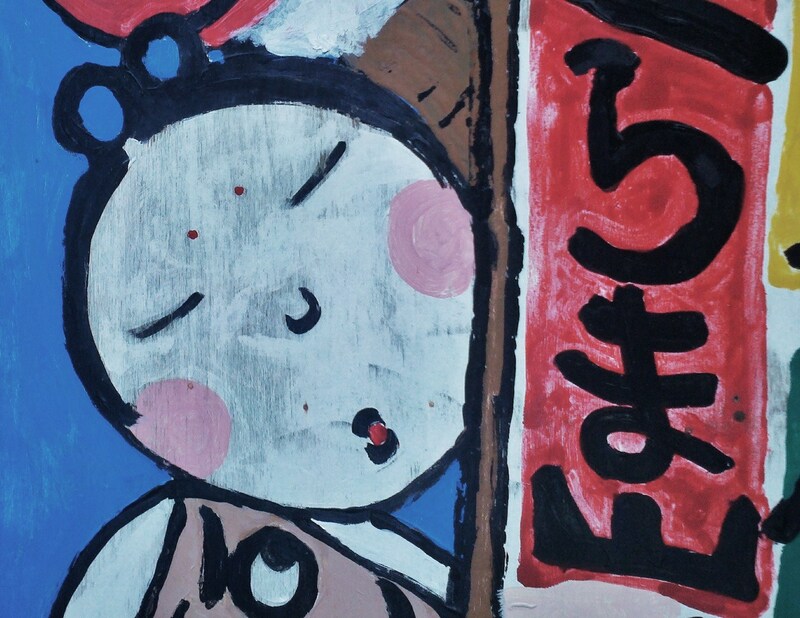 Sign (Kuramayama). On the way back to town. Just south of town, looking down the Kurama River. Restaurant, "Kuramasou," along the river, near the train station. 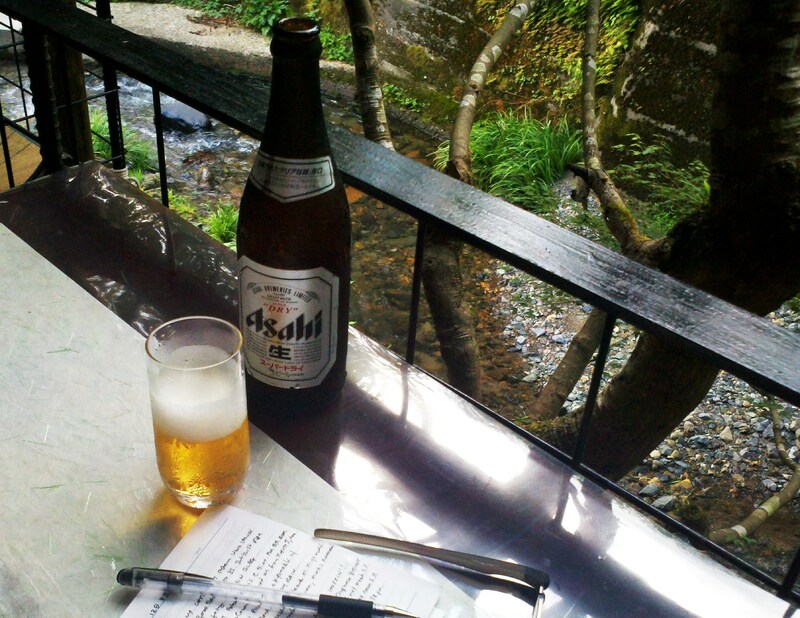 A cold beer on a hot day, Kuramasou restaurant. 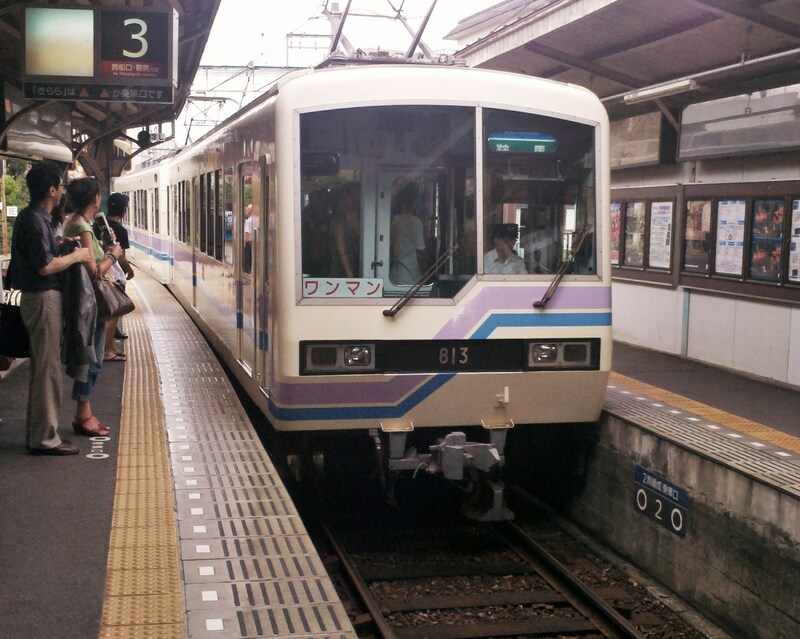 From Kyoto, take the Keihan (train) Line to Demachiyangi Station (the last Kyoto station on the Keihan Line). Follow the signs to the exit for Demachiyanagi Eizan Railway Station (connected to the Keihan Station). 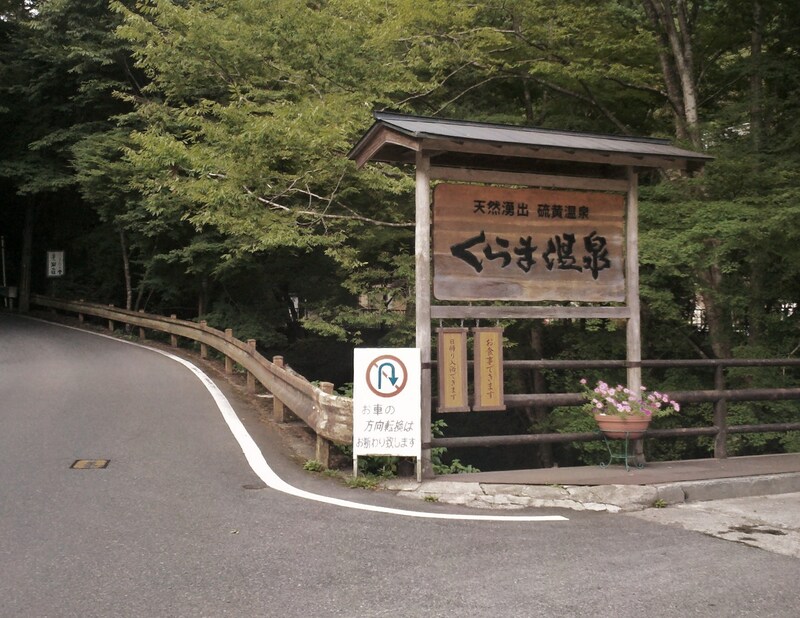 Buy your ticket at the ticket machine (see very first photo above) for Kurama (¥410), or to Kibune-guchi, if you want to take the hiking trail into Kurama). 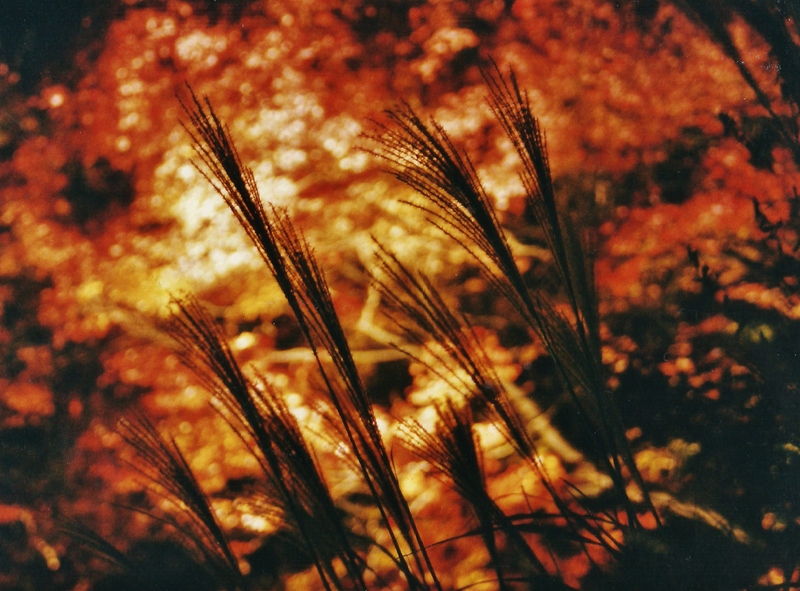 Two more, from Autumn 2003 . . . 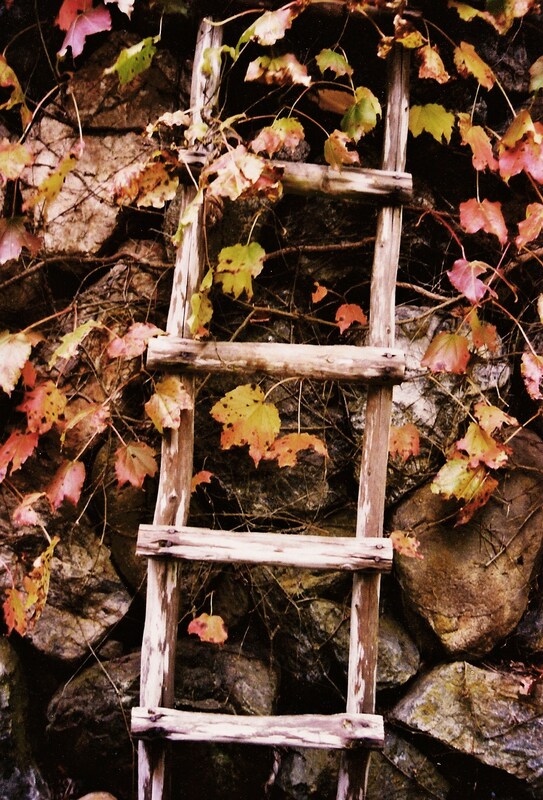 Ladder against house. Kurama. 2003. Along the Kurama River. August 13, 2011. 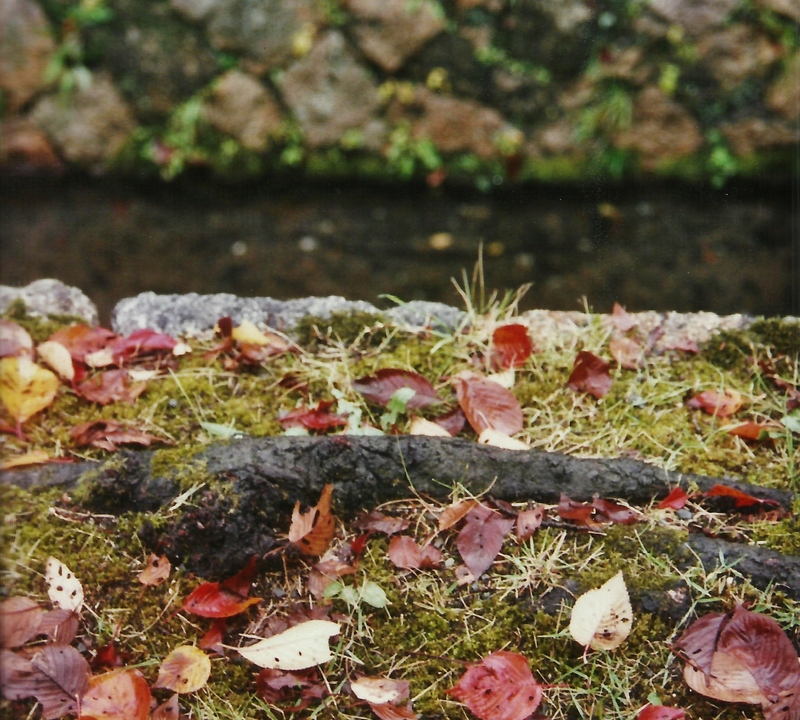 Note: In 2011 I updated this post with a few photos I took Kyoto in November 2009; taken a little over a month after I first posted this piece. After you (hopefully) enjoy this photo essay, I hope you’ll click over to my 2012 Autumn album. The Takase Canal. Kiyamachi, Kyoto. November ’09. Autumn’s my favorite season. I suppose it comes from being a native of Virginia, growing up just outside of Washington, D.C., where during my childhood autumn seemed to last forever. Cousins lived — and now raise their own families — in the Shenandoah Valley. My grandparents on my mother’s side lived in West Virginia when I was very young, and then moved over to Shenandoah, Virginia. The glorious leaves, the cool crisp days and chilly nights, football season, Halloween, Thanksgiving, apples and apple cider and a slow, sweet transition into the Christmas Season. As a teenager and then as a college student I found autumn the most romantic time of the dating year and most of my fondest memories of that aspect of my life were played-out against the backdrop of autumn. Kurama. Just north of Kyoto. October 2003. The first time I went to live in Japan, near Hirakata-shi and within about a half-hour of Kyoto, or Osaka, depending on which direction one takes the Keihan Line, was in August. So I was able to experience the transition from summer into autumn in Japan. 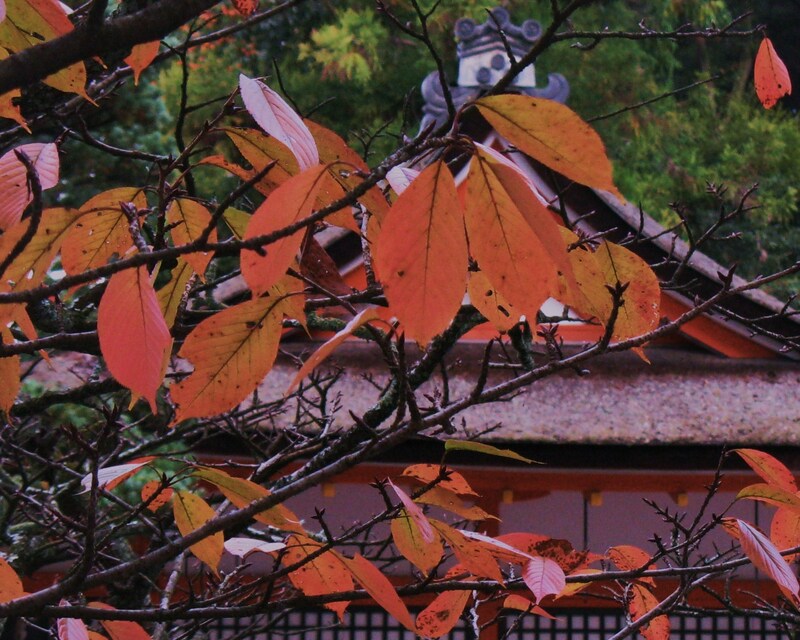 Through two living experiences in Japan and a couple of dozen of 1- to 3-weeks trips there over the past 10 years, I count autumn as my favorite time in Japan, too. Autumn in Japan: its heavy, oppressive, debilitating humidity takes a holiday, the Japanese maples (もみじ) transform into millions of delicate blazes of red and gold, lengthening shadows and deepening shades of red and orange, charcoal-sweet smell of roasted yams (still in the skin, of course) wafting about in both city and countryside. 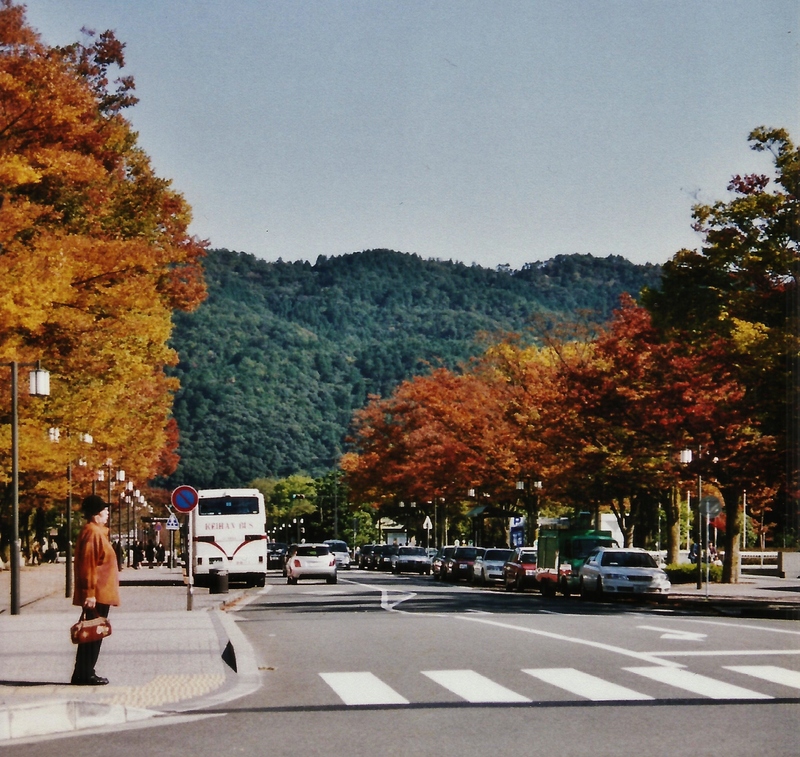 “Sweater Weather.” The sycamores that line Ni-jo Street in Kyoto, east of the Kamo River. Comforting memories of dear people who’ve wafted like sweet smoke in and out of my life — or was I the shade that merged into and out of theirs’? 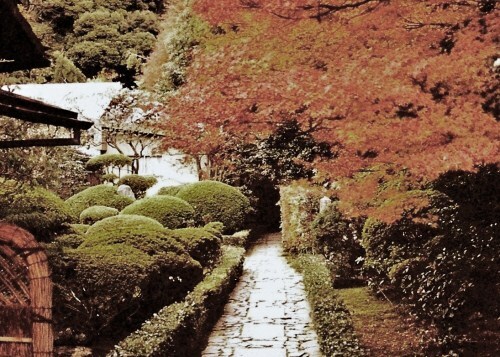 — all make autumn in Japan particularly special for me. I remember one cool autumn night in Kyoto, around 2003 when I and my traveling companion had just flown across the Pacific, gone through the Rites of Immigration, Customs and Baggage Claim at Kansai International Airport, taken the “Haruka” train from the airport to Kyoto Station, been picked up at the station by my Sensei, my Japanese language teacher from college, and taken to his and his wife’s home in North Kyoto. We ate some, drank a little beer and sake and then turned in after a long, long, long day. 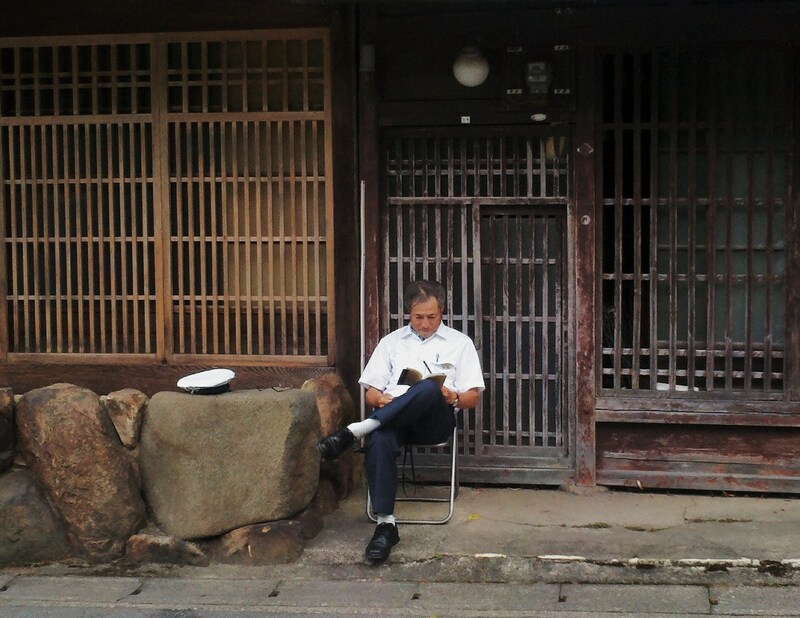 The last thing I remember hearing as I drifted off was the sound of a man singing, almost chanting, just outside the window, pushing his cart of roasted sweet potatoes through the narrow Kyoto streets, plodding on by with his voice rising and falling — “R o a s ted yaaaa…ms! R o a s ted yaaaa…ms” (“yaaahhhhkeee eeemohhhh, yaaahhhkeee eeemohhhh…“). He sounded elderly. Was he? I think it was the most beautiful song I had ever heard. Canal from Lake Biwa. Kyoto. November 2009. 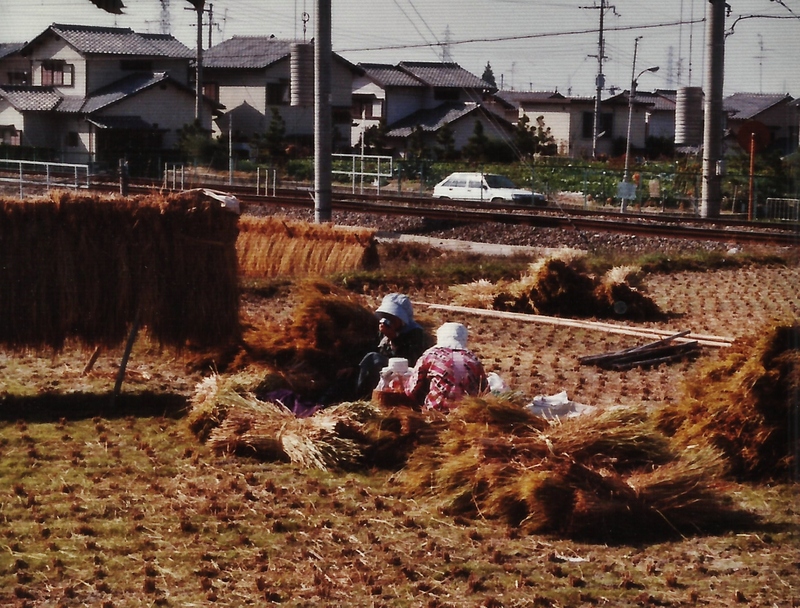 Harvesting Rice. Near my house. Hirakata. Autumn 1984. 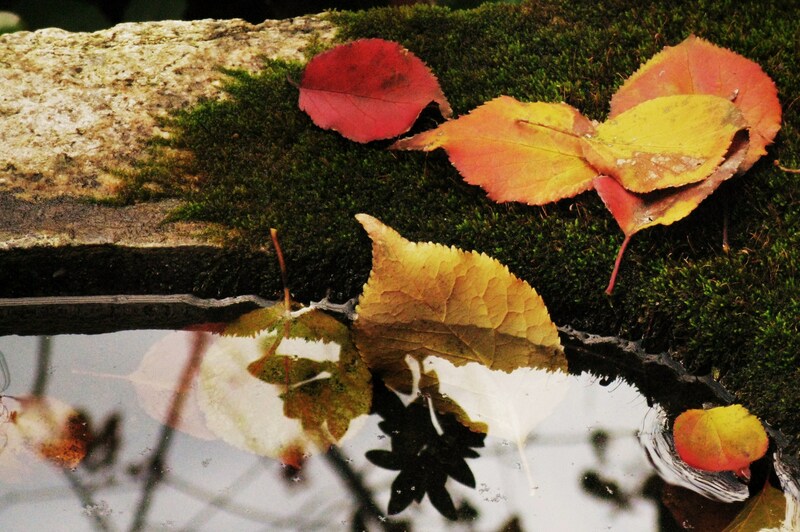 Leaves in Stone Basin. Shoren-in. November 2009. At Shinnyo-do Temple. Kyoto. November 2009. 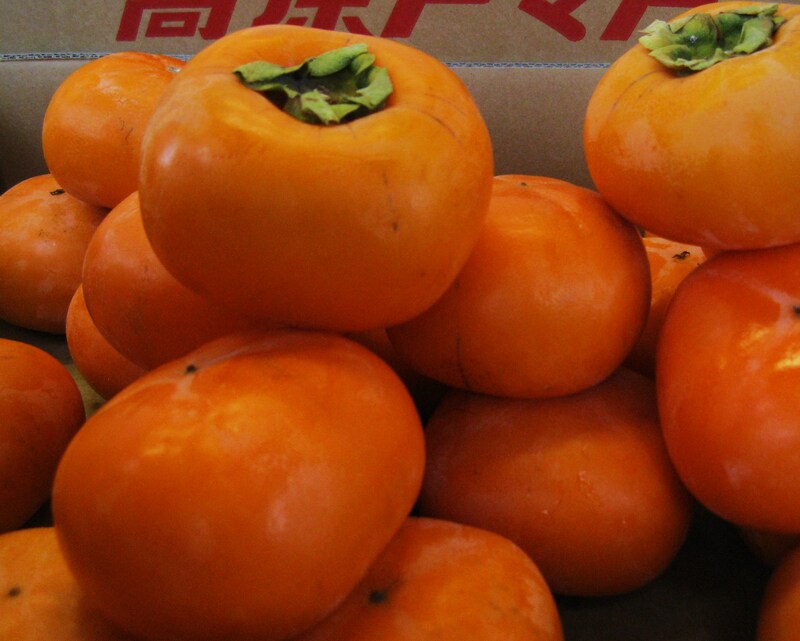 Persimmons (柿). 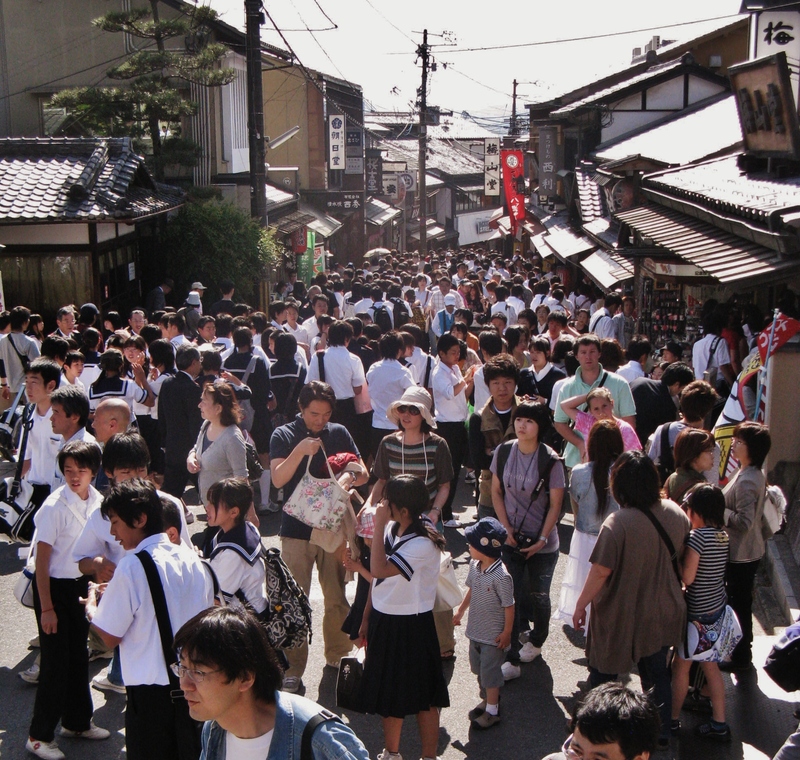 Kyoto, Okazaki, Market. November 2009. Katano-san. Near my house. Autumn 1984. 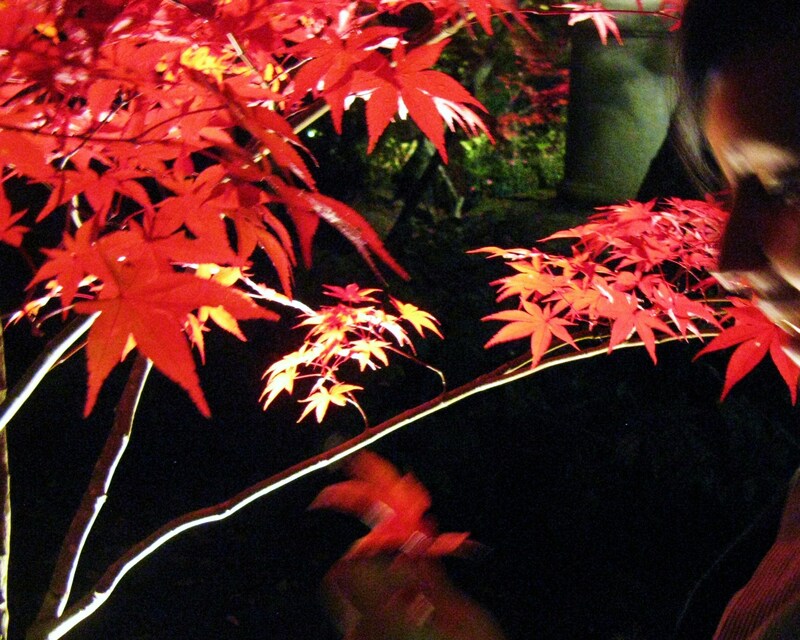 Friend at Eikan-do (永観堂) “Light Up.” Kyoto. November 2009. Along the road, near Chion-in. November 2009. Overcast day in Pontocho. Kyoto. November 2009. Wall at Shinnyodo Temple. Kyoto. November 2009.